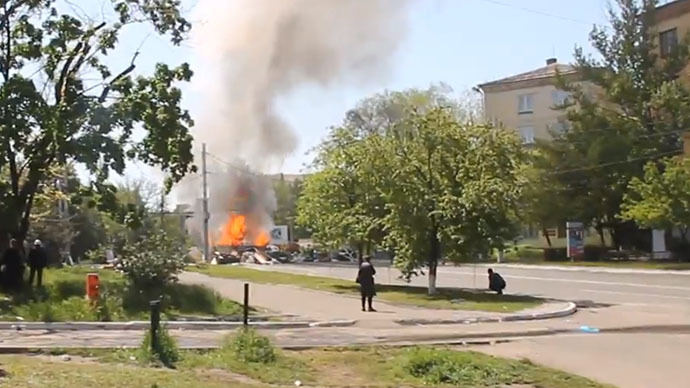 An APC, allegedly captured by self-defense forces from Ukrainian troops, was set ablaze in the center of Mariupol in the aftermath of Friday’s bloody clashes. 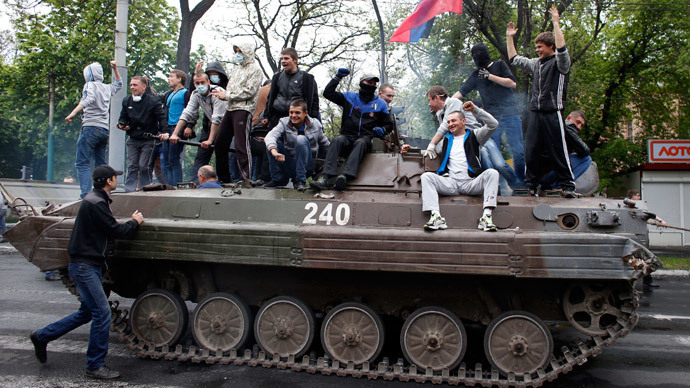 The Ukrainian National Guard has announced it will temporarily withdraw from the city center. On Saturday afternoon, the sound of gunshots and explosions was once again heard in the center of the city, which is located on the Black Sea coast in southeast Ukraine. A Ruptly producer said gunshots could be heard near the hospital where a wounded RT stringer is being treated. Those were most likely from ammunition exploding inside an armored personnel carrier (APC), which was set on fire. The APC appears to be the one captured a day earlier by self-defense forces. It was not immediately clear who had set the vehicle ablaze. There are unconfirmed reports that it was done by the locals, who threw Molotov cocktails at it. According to Graham Phillips, Ukraine-based stringer for RT, pro-referendum activists have taken over a Ukrainian army base. “Today they were taking supplies out of it, destroying signs of Ukraine. And they took the 1 APC out of the premises, for them to use,” he said Saturday. Meanwhile, the Ukranian National Guard announced on Saturday it withdrew its troops from the center of Mariupol. “Now forces of the National Guard have been withdrawn from the epicenter of events in order not to provoke more aggression of the part of activists and also for the sake of ensuring security for peaceful Mariupol residents,” the Guard’s press-service said. 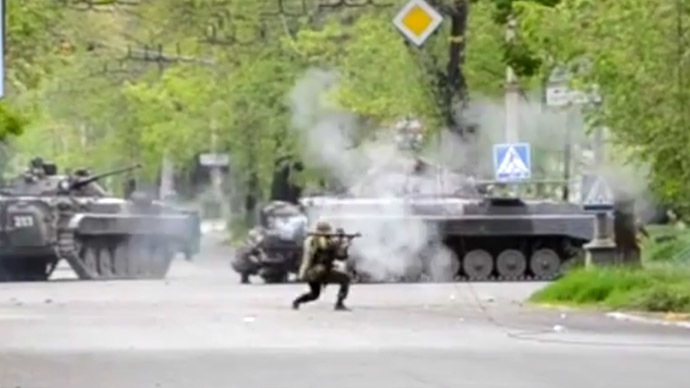 The leadership of the National Guard has described the current situation in Mariupol as “steadily tense”. Earlier on Saturday a day of mourning was declared in Mariupol by the city administration following Friday’s violence. Seven people died and 39 were wounded then as a result of clashes between Ukrainian troops and local self-defense activists, Mariupol health officials say. 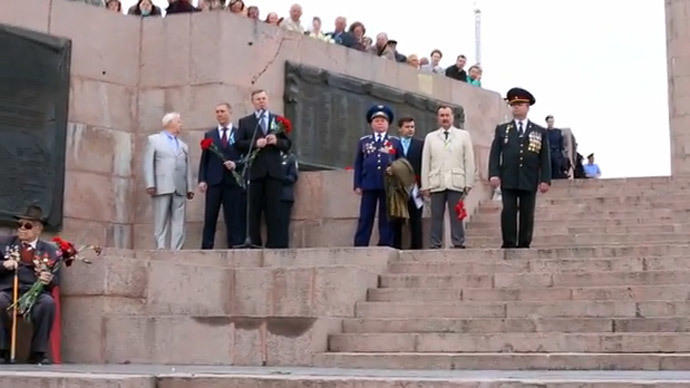 “Because of the tragic events on May 9, 2014, which resulted in casualties, May 10 is declared a day of mourning in the city of Mariupol,” the city administration statement reads. The Ukrainian Interior Ministry is providing a higher death toll for Friday’s violence in Mariupol, saying that 20 anti-Kiev activists were killed and four more were taken captive, according to a Facebook post by Interior Minister Arsen Avakov. Kiev’s forces were using heavy weaponry and tanks in Mariupol to storm the local Interior Ministry building, where local police have barricaded themselves in, refusing to take orders from Kiev. At some point, residents began flocking to the scene. A representative of the self-defense forces said that one of the armored vehicles opened fire at a group of unarmed civilians. 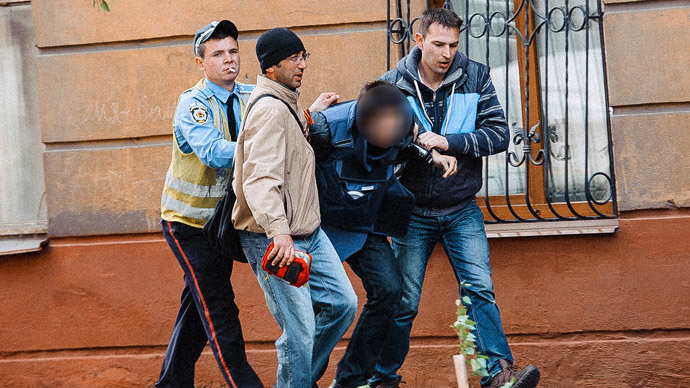 Authorities in Kiev intensified their military operation against anti-government protesters in eastern Ukraine in early May. The hotspots for military activity have been the cities of Slavyansk, Kramatorsk, Konstantinovka and Mariupol, all situated in the Donetsk region, which is about to hold a referendum on the possibility of independence from Kiev.